In Barbara Kingsolver’s novel ‘The Lacuna’, hero Harrison Shepherd is half Mexican, half American. After growing up in gloriously warm and exotic Mexico, he moves to staid, chilly North Carolina. In Mexico, Harrison unravels the secrets to life as he spends his days in the kitchen with the cook, learning to make fluffy breads and wonderful sweets. Upon spending his first Halloween in the USA, he observes that the children turn up at the the door a few days early. He has yet to prepare Pan de Meurtos (Bread of the Dead) and has nothing to give them when they come trick or treating. He is of course making a joke, implying that Halloween in the USA is the Mexican celebration Dia de los Meurtos (Day of the Dead) which honours the deceased with their favourite foods and picnics at grave sites. After reading this great novel, I was primed to attend* the Dia de los Meurtos celebrations at the Burrito Bar in Rosalie. The strains of a Mariachi band in full swing greeted us on a very balmy Thursday evening. I was lucky enough to be attending as a guest blogger so got to enjoy frozen guava margaritas whilst Anthony enjoyed Coronas. In an emerging trend, Mexican eateries seem to be leading as far as licensing in ‘fast food’ restaurants. Amongst the sugar skulls and corn chips, I had a chat with Luke McGrath, the owner of the Burrito Bar franchise. Like many of the new wave of Mexican establishments, a passion for fresh, local produce and a desire to introduce Australians to true Mexican flavours seems to be a driving force. 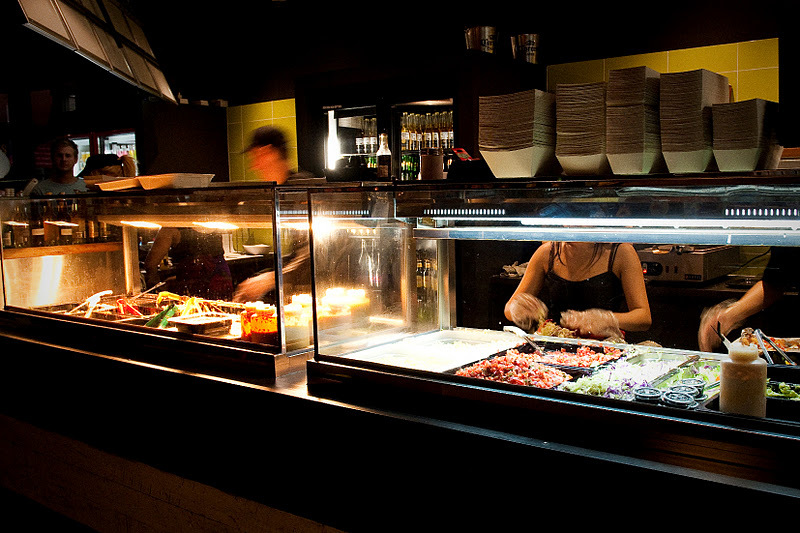 Burrito Bar’s philosophy is ‘Fresh Mexican – Street Style’. There’s the usual range of burritos, quesadillas, tacos and salads as well as something I have not seen on other menus – the house speciality Elote. This is char grilled corn with a range of sauces and a squeeze of lime. Mexican fries are good old fashioned crinkle cut chips with a spicy seasoning. Enjoyable but not really ‘authentic’. Some eateries go Subway style where you select your wrapper, filling and salad. Burrito Bar goes for a fixed menu with a variety of combos built around core fillings such as slow roasted beef, pork, vegetarian and even fish. Burritos are given a spice rating to assist in choosing the dish for you. The chicken is free range and Luke says he is after high quality ingredients sourced from Queensland based businesses. He also sources his tortillas locally, from Diego’s Tortilla Factory on the Gold Coast, rather than give in to the easy option of buying from a multinational. I had the Mariachi Burrito with slow cooked Peurco en Chipotle (spicy pork), rice, black beans, tomatillo salsa, lettuce and other goodies. Now when they say spicy, they mean spicy as well as smokiness from the chipotle peppers and spices that the pork was marinated in. Anthony went for the Ultimate Mexican with Chicken and Carne Asada (spicy grilled steak) Burrito and the mix was delicious. For me, this was the standout. Our orders were freshly made and delivered in baskets to our table (perhaps you may need to wait at the counter for yours) in no time at all. I did think the filling could have been warmer and the other thing to watch out for is that because the tortillas are fresh and soft, the burrito is not very ‘sturdy’ to hold on to so towards the end of the meal, thing are little sloppy. None the less, the burritos were generous in size and whilst I had ordered the small and Anthony the large, there did not seem to be a great deal of difference in size but there’s only a few dollars in it either way. Others enjoyed great looking layered Taco Salad bowls and the most magnificent Nachos I have ever seen. There’s the usual Mexicano suspects for dessert and a kids menu too. This is fresh, fast food that has a bit of style about it. It’s somewhere you can go for lunch or a quick bite to eat with friends, enjoying a relaxed atmosphere and a beer or two. I suppose the big question is, would I go back and try some of the other items? Yes, yes I would.